According to the NASA Jet Propulsion Lab, "the contents of the record were selected for NASA by a committee chaired by Carl Sagan of Cornell University. Dr. Sagan and his associates assembled 115 images and a variety of natural sounds, such as those made by surf, wind and thunder, birds, whales, and other animals. To this they added musical selections from different cultures and eras, and spoken greetings from Earth-people in fifty-five languages, printed messages from President Carter and U.N. Secretary General Waldheim. Each record is encased in a protective aluminum jacket, together with a cartridge and a needle.
" You can see the contents of the disk in the four categories, which also encompass our scientific understanding from maths, physics, chemistry and biology - including our DNA and reproductive systems. 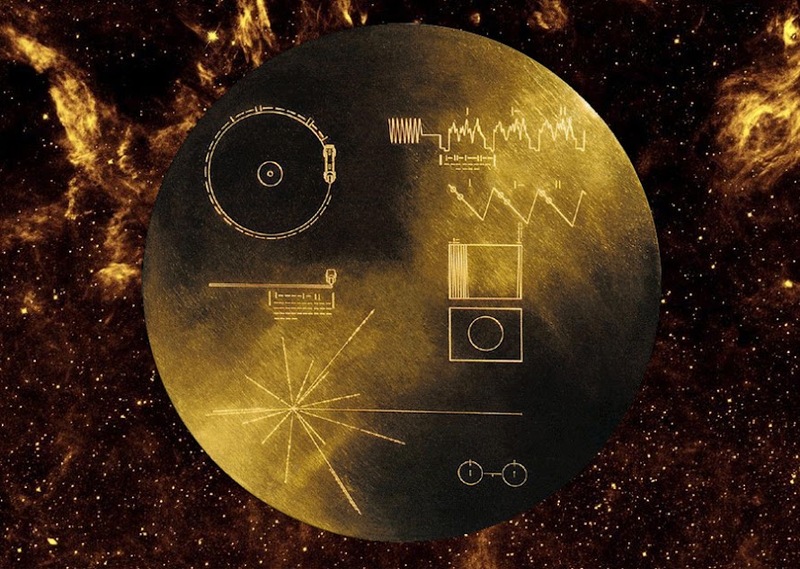 "Instructions, in symbolic language, explain the origin of the spacecraft and indicate how the record is to be played. The 115 images are encoded in analogue form. The remainder of the record is in audio, designed to be played at 16-2/3 revolutions per minute. It contains the spoken greetings, beginning with Akkadian, which was spoken in Sumer about six thousand years ago, and ending with Wu, a modern Chinese dialect. It will be forty thousand years before they make a close approach to any other planetary system. As Carl Sagan has noted, "The spacecraft will be encountered and the record played only if there are advanced spacefaring civilizations in interstellar space. But the launching of this bottle into the cosmic ocean says something very hopeful about life on this planet."